On April 7th, the Washington Post's David Ignatius, known for both his expertise in foreign affairs and his access to foreign policy makers in the Obama administration, wrote of "the delicate path ahead on Iran." In Washington, some experts suggested that Khamenei's rejection of key elements of the deal was merely a form of political posturing meant to reassure hardliners in Iran, hinting that they expected him to eventually come around to the stricter terms of the agreement. Ignatius, in his essay on the 7th, wrote the following: "Obama's outreach to Iran has been shaped from the beginning by his effort to understand how Iranians see the world — and to distinguish between truly dangerous, aggressive actions and more comprehensible defensive moves. This empathetic view is part of what irks Israeli Prime Minister Benjamin Netanyahu. But centuries of diplomatic history suggest that such an ability to see the world through the adversary's eyes is essential for effective negotiation." Contrary to Ignatius' claim, Obama has not sought to "understand how the Iranians see the world." 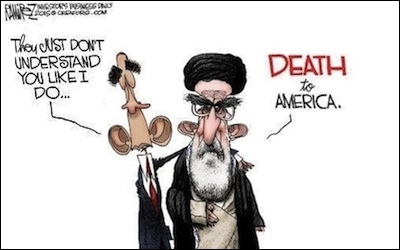 While intending to commend the President, Ignatius unintentionally put his finger on a core fault of Obama's approach to Iran. For, in reality, the President has not, "from the beginning" sought to "understand how the Iranians see the world." Perhaps he has sought to understand how he would see the world if he or another leader not motivated by the ideology of the Islamic Republic were making decisions in Tehran. But contrary to Ignatius' claim, the President has firmly resisted efforts to understand how the leaders of the Islamic Republic view the world through the lenses of their own ideas. For what the leaders in Tehran might view as "more comprehensible defensive moves" are, in the view of Iran's neighbors, examples of terror and aggression. There is a difference between empathy and understanding. To empathize is not only to understand another's situations, feelings and motives. Doing so is, as Ignatius rightly points out, essential to effective diplomacy and negotiation. It also entails projecting one's own feelings onto others and thus asks how we would act if we were in the situation of the other. Doing that is problematic when dealing with the foreignness of foreign affairs and the otherness of other countries because foreigners and others often think about the world very differently than we do. The great German sociologist and historian, Max Weber argued that in interpretive sociology and in historical scholarship, understanding the actions of others required paying close attention to the meanings these actors give to their actions. That is, for Weber, to understand what others do, it was not acceptable to put ourselves, with our values and outlooks into their shoes. Such empathy sounds nice but it falls woefully short of the task of understanding. Understanding dispenses with the sentimentality of the empathizer and asks instead to pay close attention to the beliefs of others, whether we find them appealing or not and then to examine the impact of those beliefs on actions. The apparent good will of the empathizer risks the fault of condescension and narcissism because it proves unable to grasp that others truly view the world differently than we do. The cold stare of the interpretive analyst who seeks to understand the other is a genuine form of humanism which acknowledges that there can be fundamental differences in the way peoples from different societies and cultures view the world—again, whether we find them appealing or not. Firm beliefs are compatible with subtle and flexible tactics, as Iranian success in nuclear talks is making clear. Let's bring this abstract discussion of history and social theory down to the earth of the Iran deal. The government of Iran wants nuclear weapons. It wants them because it views them as indispensable to accomplishing its ideological goals of expanding its version of Islam in the region and around the world and destroying the enemies, such as Israel, which it finds morally repugnant and which stands in the way of its goals. These beliefs are based on decades if not centuries of religious interpretation and will not be changed by a President of the United States who is in office for at most eight years. These beliefs are so deep-seated and firmly held that they have withstood efforts at reform and cultural — but not scientific and technical! — modernization. Firm beliefs are compatible with subtle and flexible tactics, as the Iranian successes in the nuclear negotiations are making clear. It is obvious that one difference between Barack Obama and Benjamin Netanyahu is that the former regards himself as a liberal while the latter is a conservative. These terms make a certain amount of sense in conventional political terms, but only a certain amount. If liberalism as a broad and old tradition is known for its effort to grasp the diversity of cultures around the world, that is, for its cosmopolitanism, then is it not Netanyahu's unflinching gaze at the Iranian's world view that stands more in that tradition than Obama's very American optimism, which believes that, at bottom, the rest of the world is just like us? Isn't it Netanyahu, not Obama, who has most engaged in what Weber would call an interpretive effort of understanding while Obama has been satisfied with the far less demanding task of empathy? In the process of engaging with Iran, the President appears to project his own views onto them, thus obfuscating the reality of their beliefs and the implications of their stated hostility for Israel, our most important ally in the region. It is odd that a president and an administration boasting a worldly sophistication condescend to Iran by refusing to take its leaders' oft-stated beliefs as guides to its policies. In this instance, sophistication and worldliness emerge more from the office of the Prime Minister of Israel. David Ignatius is certainly right that seeing the world through the eyes of others is indispensable for effective diplomacy, and, one should add, for effective military strategy as well. It is, in part, precisely because the President and his administration have paid insufficient attention to the task of interpretive understanding of the Iranian leadership that he embarked on this "delicate path," one that led in Lausanne to a very bad deal which, it now appears, Ayatollah Khamenei had not agreed to after all. His Friday afternoon audiences continue to chant "death to America" and "death to Israel." There is no sophistication or worldliness in dismissing this horrific mass bellowing as empty rhetoric.